There are few things more enjoyable than being able to relax in a clean, sunny room of your home. Natural light is important for our physical and mental health. We need sunlight in order to get our full amount of Vitamin D and stay energized and productive. Sunshine also helps boost our mood and immune system, and can even produce feelings of calmness when one feels anxious. But there comes a point where a certain amount of sun is just too much. You want soft, natural light that radiates through your home, not a harsh glaring light that pierces your windows and hurts your eyes. That’s where glare reduction window film for your Colorado Springs home can help. Perhaps your home gets too much sun in the evening, which creates glare that ruins your tv watching time with your family. Or maybe you work from home and you’re tired of having to close the blinds just to be able to see your computer screen. Whatever the reason, you’re searching for a solution that can help you get rid of the glare without blocking out the sunlight completely. And glare reduction window film is your answer. 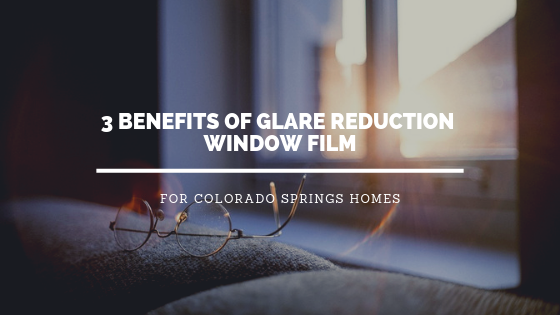 Glare reduction window film provides a way to fill your Colorado Springs home with natural light without having to deal with harsh, annoying glare. Spectrally selective technology separates the electromagnetic spectrum to block spectrums of light that create glare while increasing natural brightness. Promotes good health- By opting for glare reduction window film instead of blinds or curtains, you can make sure your family gets access to the sunlight you need to stay healthy. Energy efficiency – Installing glare reduction window film can also help you save money since window film will make your home more energy efficient. UV blocking – UV rays from the sun are detrimental to colorful objects like furniture, flooring, and art, and can cause them to fade. By installing glare reduction window film, you can protect your Colorado Springs home from uv radiation. Get rid of harsh light and glare in your home. Call our office today to get a quote on glare reduction window film in Colorado Springs.